Renault Argentina presents the Sandero as the car that makes the journey itself something to look forward to, in “Figures”. Drivers and passengers stuck in heavy city traffic reveal their hidden desires through balloon figures floating above their vehicles. They’d rather be fishing, on the beach, skiing, on a playground, playing football, in the bath, watching TV or in bed. There’s one exception – the guy who just wants to be driving his Renault Sandero. “Dejás de pensar sólo en llegar”, is translated in English as “Don’t Just Think of Getting There”. Figures was developed at Publicis Graffiti, Buenos Aires, by chief creative officer/copywriter Diego Livachoff, chief creative officer/art director Diego Sánchez, copywriter Matías Corbelle, executive agency producer Marcelo Soruco, and agency producer Maximiliano Martinez. 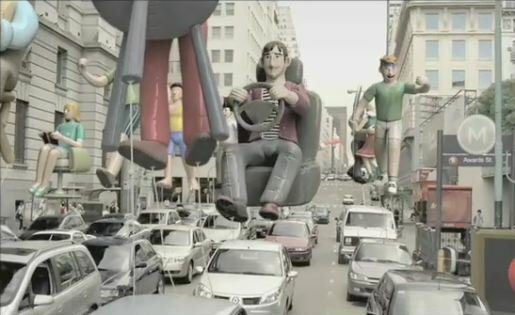 Filming was shot by directors Nico & Martin (Nicolás Pérez Veiga and Martín Kalina) via Awards Cine, Buenos Aires, with director of photography Hugo Colace, executive producer Fernando Damiano and producer Marcos Negri. Animation was done at Bitt Animation, Buenos Aires. Editing was done at Cinecolor, Buenos Aires. Post production was done at Edgard Allan Post. Sound was designed and original music was produced at Papa Music, Buenos Aires. The spot was awarded a Gold for automotive at the London International Awards.